Like the waking capitalist nightmare it’s based on, the board game Monopoly invites subterfuge. Steal from the bank. Invent a “house rule” and punish your friend for breaking it. Pinch someone else’s hotel off that one expensive property. Even psychological torture is on the table. I used to bleed my brother dry for hours on end, never letting him quit; my mom recalls me playing against her friend, a successful real estate agent, and securing his ruin between a 10-year-old’s taunts. A good round of Monopoly leaves the losers totally broken and the winner feeling disturbed and complicit, shaken by their own cruelty. You needn’t actually cheat, in fact, because monopolism is cheating, an unfair point of leverage in a system rigged at every level. Acknowledging that you play the role of a villainous, unethical property developer in Monopoly isn’t just a timely gesture for the Trump era; it’s also a long-overdue shoutout to the woman who invented the format. The board you grew up playing on is a plagiarized adaptation of the Landlord’s Game, patented in 1904 by a woman named Lizzie Magie. In the 1930s, the Parker Brothers scooped up Magie’s patent for $500. Unlike the knockoff, the Landlord’s Game was intended to critique the American marketplace with a “practical demonstration of the present system of land-grabbing with all its usual outcomes and consequences,” according to Magie. The ideas baked into her concept came from the political economist Henry George, a progressive best known for arguing that land should be common property, which he said could be accomplished by taxing land value. A sharp eye would still catch the satirical element of today’s Monopoly board — not least because the streets are borrowed from Atlantic City, a place incidentally ravaged by Trump’s greed — but most don’t realize the product itself is a grift. Magie never allowed any changes to the Landlord’s Game, concerned that its lessons would be lost, while a few men made a fortune from their carbon copy of it, which downplayed the near-socialist themes and elevated the rags-to-riches storyline. Magie didn’t receive royalties on Monopoly sales, and it wasn’t until Parker Brothers sued the creator of a 1970s Anti-Monopoly game for trademark infringement that anyone rediscovered her as the true inventor. But even Magie’s original board hinged on a dark observation: accumulating wealth and crushing your rivals is fun. George’s cooperative bent was antithetical to the competitive spirit that makes for an entertaining afternoon of shouting about fake money and mortgages with your family. When we ask why oligarchs continue to plunder the country after accumulating billions — why too much money is never enough, and more should be sought without scruple — we are forced to one conclusion: It’s all a game for them. They flout financial law because at that level of wealth, the stakes are theoretical, the rules no more relevant than the fine print on the inside of the Parker Brothers box. And to own a Monopoly set is to control the application of those rules in the first place — which will be ignored or cynically revised for your assumed benefit. 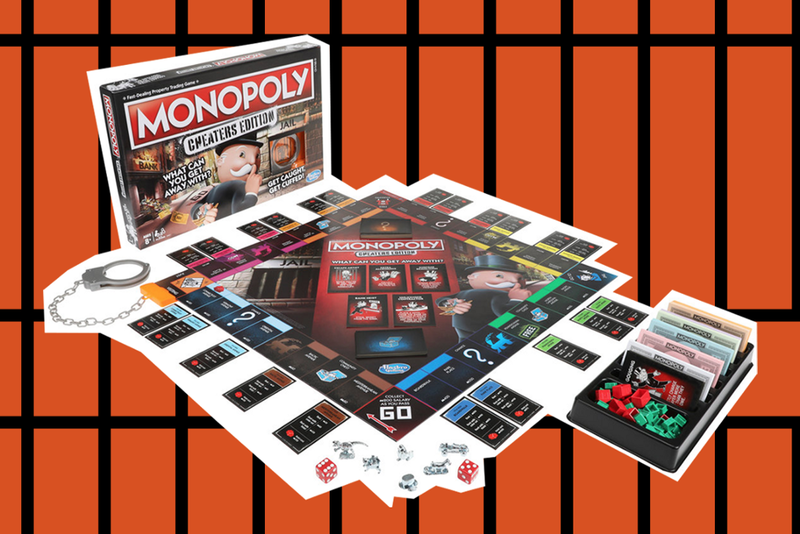 So kudos to Hasbro for digging into Monopoly’s radical roots in a way that improves its real-world resonance, here on the cusp of another economic collapse. The only problem is you can’t really control the rejection of norms with a new layer of instructions; to cheat is to undermine the very structure of a game, including any provisions for deceit. As soon as Americans get their hands on this edition, they’ll begin to take it apart from the inside, pressing for sleazy advantages the designers hadn’t considered. They’ll figure out how to cheat at cheating. What better example of American ingenuity is there?